There are plenty of great ways to make the most of your backyard space. It really ought to be a place where you can relax and entertain, which is why we take a lot of pride in what we can offer our clients throughout Arizona. Landscape design means more than knowing the right materials to use: it's about knowing how to make the best use of the space and how to bring out the best in a client's design concept. These issues are all really important to keep in mind when it comes to designing outdoor kitchens and barbeques. They need to look great but be functional as well. We've previously written about outdoor kitchens, so let's take a couple minutes to look into the various concerns that you may have about outdoor barbeque design. Like outdoor kitchens, outdoor barbeques are built around an experience of cooking, good company, and leisure. They're made to be places that are functional and relaxed, or central areas where entertainment and conversation can occur. Of course, the main focus of the outdoor barbeque is the grill and the right set-up that makes the most of what you like to cook. In many ways, the design is centered on the grill and what you like making most. This will help define the best layout of the outdoor barbeque, the colors of the stonework, the materials used, and the add-ons to the outdoor kitchen area. 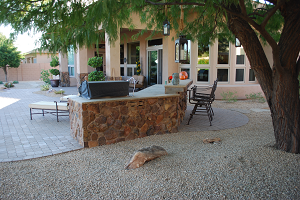 We have years of experience with landscaping and patio design in the greater Phoenix area, so we will bring all of this expertise to your backyard in order to meet your needs and help you realize your outdoor barbeque concept. By considering the layout of your backyard and what you'd like the look to be, we will help you consider the equipment and the extras that you need to make your outdoor barbeque the best that it can be. Is an outdoor barbeque right for me? That really depends. If you are a barbeque or grilling enthusiast and enjoy cooking outdoors, an outdoor barbeque seems like a no-brainer. If you entertain neighbors and guests on a regular basis or have a lot of cookouts, it also makes sense to consider having an outdoor grill in your backyard. If it's something that you're on the fence about, then it's important that you measure all of your options carefully before jumping into a decision. This is an investment that cannot be taken lightly, and we feel it's important that your patio expresses your personality and your interests. If you decide an outdoor barbeque is not for you, there are plenty of other things that can be done to improve your patio or backyard that are more in line with your needs. We can help you with those design and landscaping needs as well. 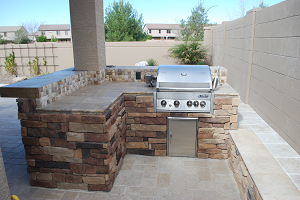 In addition to the outdoor grill, our Arizona hardscape design experts can also recommend ovens, smokers, coolers, outdoor refrigerators, ranges, and other items that can enhance your outdoor kitchen area. While we're eager to make suggestions, rest assured that you'll always have final say about what you want in your own backyard. For more information about outdoor barbeques and kitchens, as well as your many other options for hardscaping and patio design, contact our Arizona landscaping company today. Our entire team is here to discuss all of your design concepts with you in greater detail, ensuring that you realize your concepts and fashion an excellent backyard in the process.